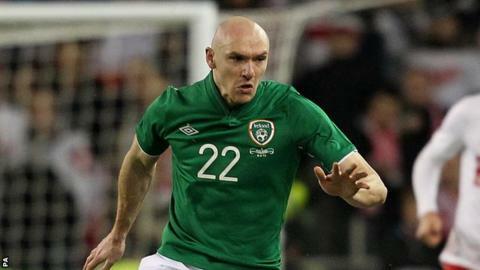 Derby County striker Conor Sammon has spoken of his pride after making his debut for the Republic of Ireland. The 26-year-old striker helped his side to a 2-0 friendly win over Poland and played the full 90 minutes. "It was an incredible experience getting to know the boys. It was a very proud moment for me to be named in the starting XI," he told BBC Radio Derby. "The game couldn't have gone much better with a win against a tough side and getting 90 minutes as well." He continued: "We have great experience in the striking department with Kevin Doyle, Shane Long, Jon Walters and Simon Cox. "I was looking at it hoping to get on for 30 minutes, so it was incredible to get the start." Sammon's Derby team-mates Jeff Hendrick and Richard Keogh joined him on international duty, and both played in Wednesday's friendly in Dublin. And Sammon said that knowing players from club level helped him settle in to an environment he had never previously experienced. "It was helpful to have familiar faces at that you see day in, day out at club level," the ex-Wigan front man added. "It makes it easier when you are in unfamiliar surroundings."